The Athletics Middle School Program in the SCCPSS is an important part of the total educational process. Athletics provides opportunities for learning experiences that are difficult to duplicate in other school activities. It teaches student athletes attitudes of responsibility and cooperation and provides a vehicle to learn mental and physical self discipline, loyalty, personal pride in the school, and respect for the rights of others. Lessons in sportsmanship, teamwork, competition and how to win and lose gracefully are integral parts of our athletics program. Athletic participation plays an important part in helping each student athlete develop a healthy self concept, healthy body and mind, school spirit, and develop pride in their school. 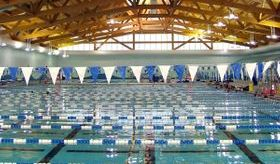 All schools will practice together at the Chatham County Aquatic Center. The Middle School teams will practice on Monday, Tuesday, Wednesday, and Thursday from 6:45-8:00 pm. The middle school swimming program will serve sixth, seventh, and eighth grade students that are eligible and capable of making the swim team.